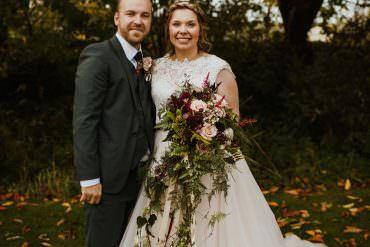 Oh how I love the autumn, ever since my boys were born in September and our wedding was also held in September, I have had a real love for the season. 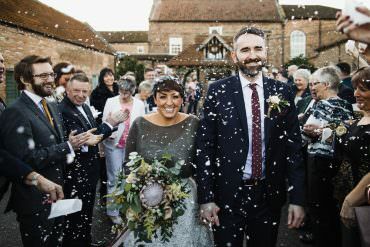 For me it’s in part thanks to nostalgia, but also in part thanks to the golden light, turning of the leaves and all the excitement of the festivities that autumn holds. 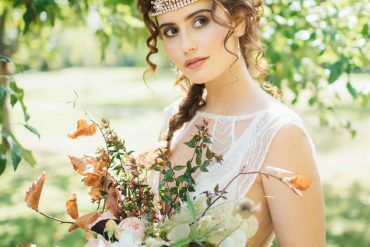 This shoot today was inspired by the transition from summer to autumn, especially the hazy golden light. 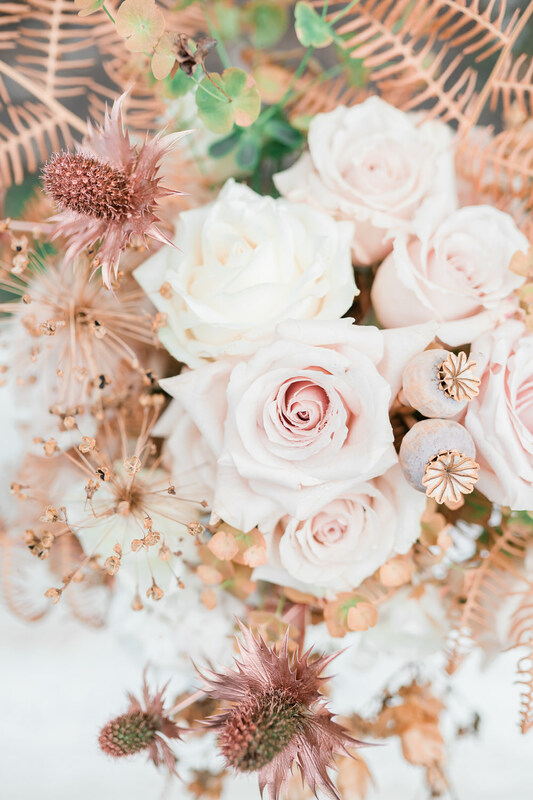 And so a wedding ideas shoot was born, with the most divine colour palette of golds, blush, cream, champagne, copper, burnt orange and russet. 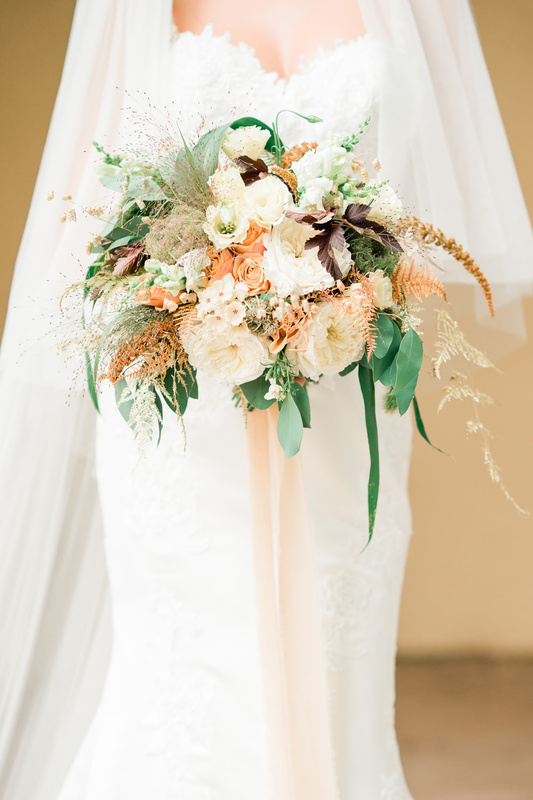 A whole kaleidoscope of autumn colours, which certainly hold wow factor. 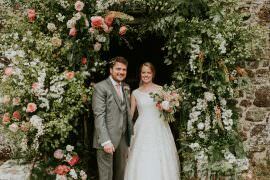 For me the centrepiece has to be the extraordinary flower arch with an array of blooms worthy of saying I do against. 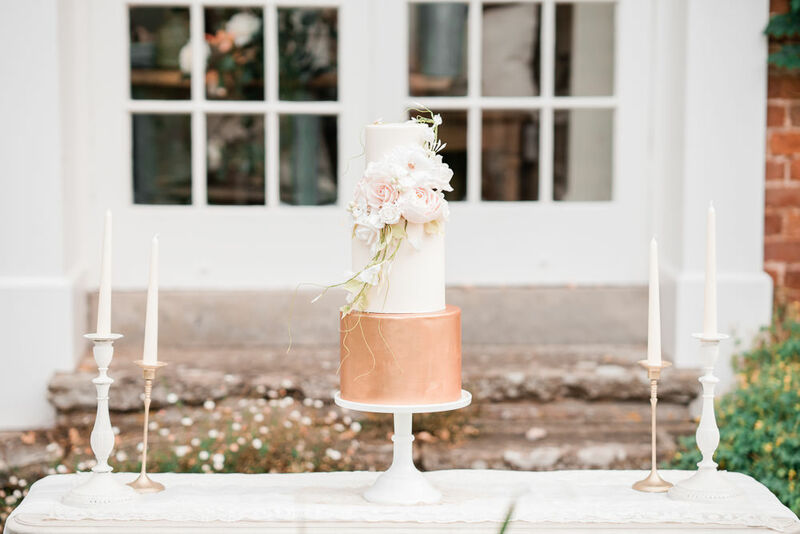 But there were also so many other stunning elements; delicate stationery, a pretty cake creation, enchanting bridal looks and a beautiful sweetheart table set up. 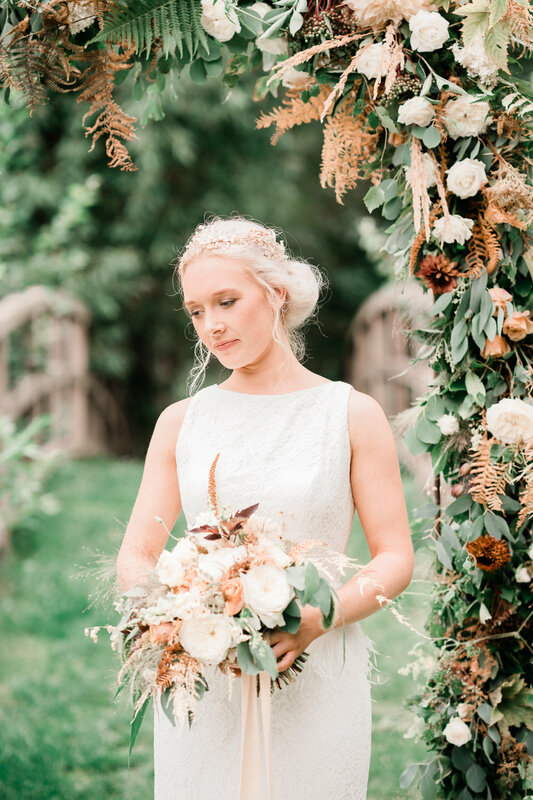 I will leave you to soak up the sublime shots by Joanna Briggs Photography, as they whisk you away to a dreamy autumnal wonderland. 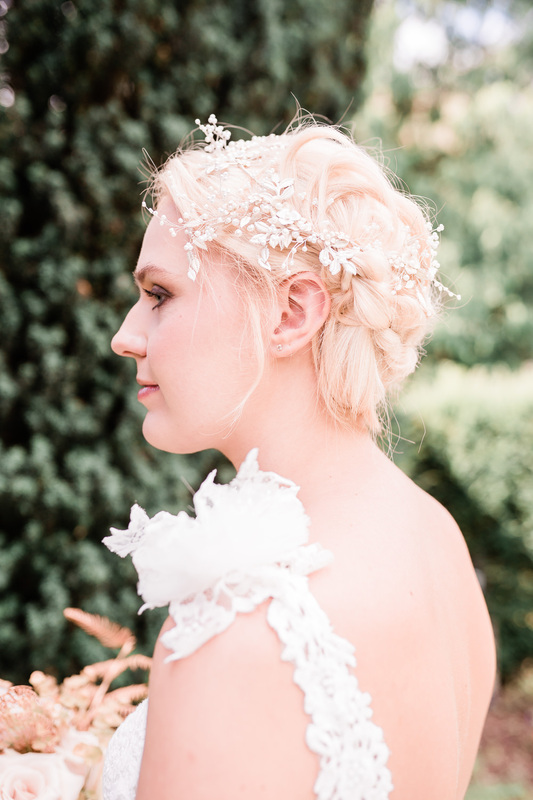 When styling my bridal shoots, I always have an initial concept which is a vision in my head of what I want to create! 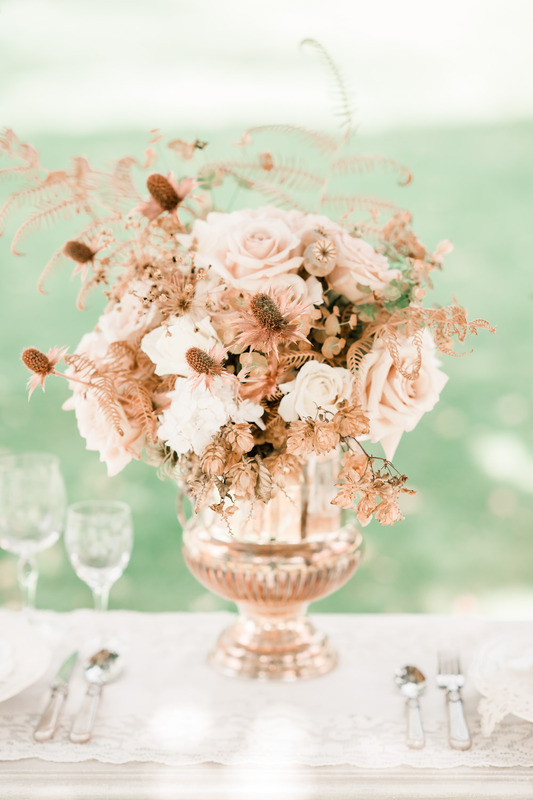 The colours always come first to me and for this shoot I imagined those last days of summer when the light starts to become golden as we head towards glorious autumnal days – I saw pale golds, blush, warm ivory and champagne accented with copper, bronze and shades of mellow burnt orange, golds and russet. 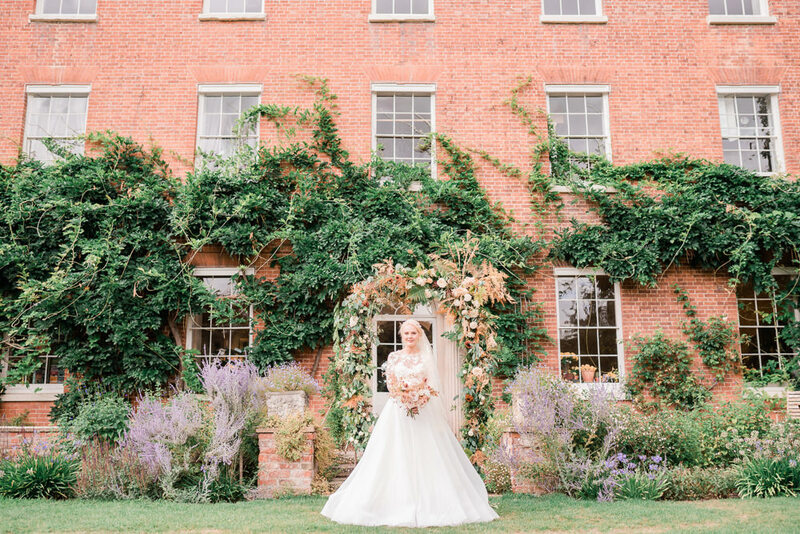 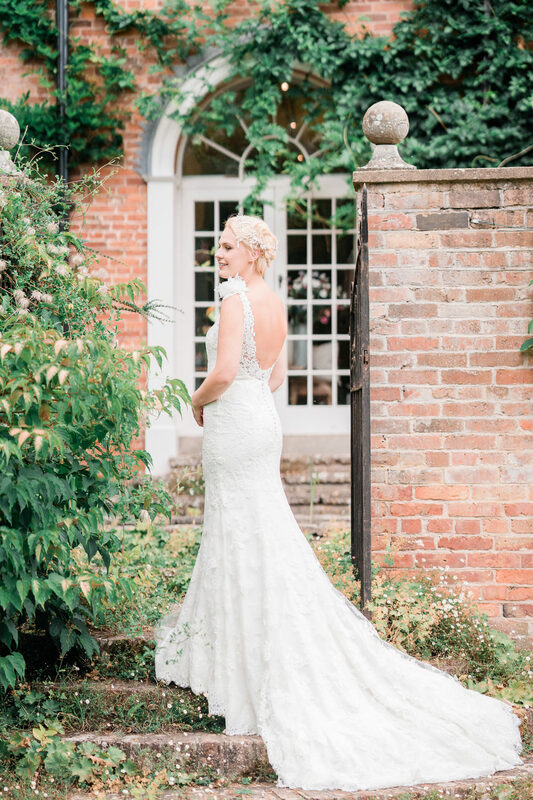 The styled shoot took place at Burford House, nr Tenbury, Worcestershire – the garden has a magical quality to it, set against the backdrop of the stunning Georgian house – it is a very special place! 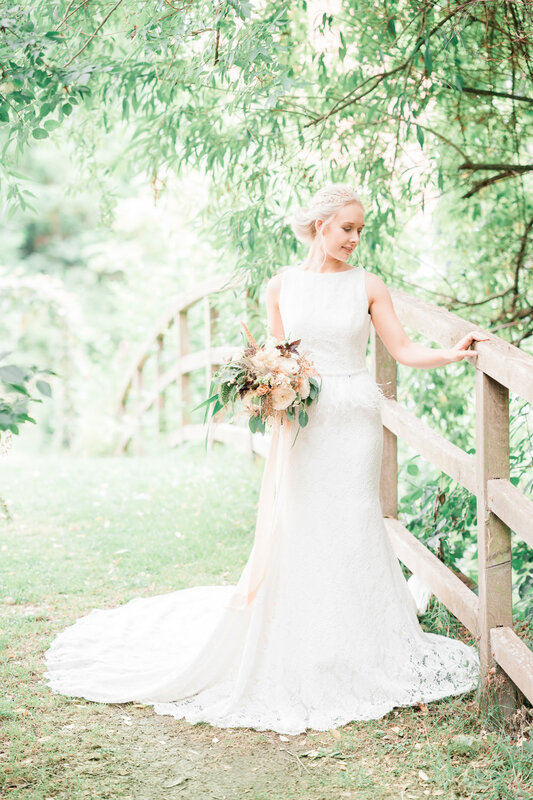 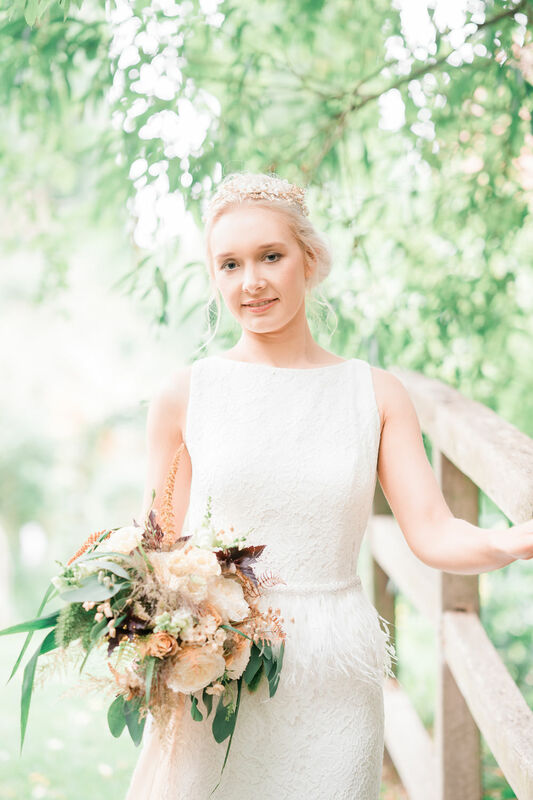 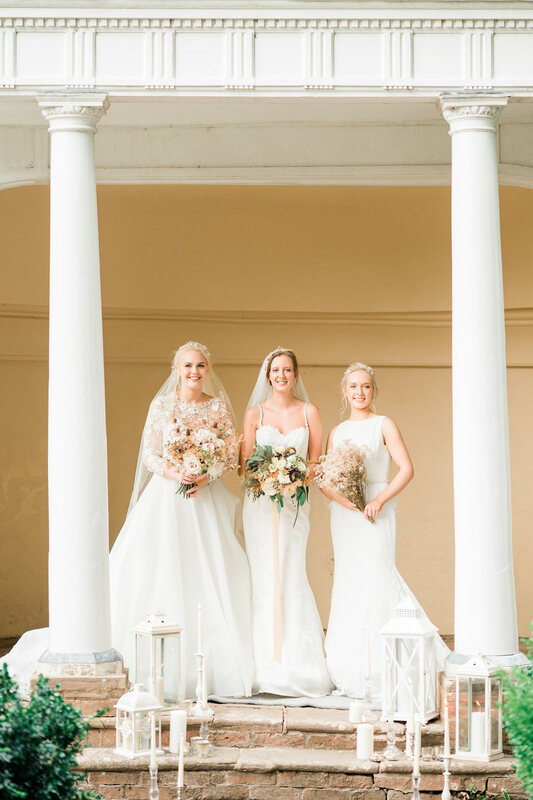 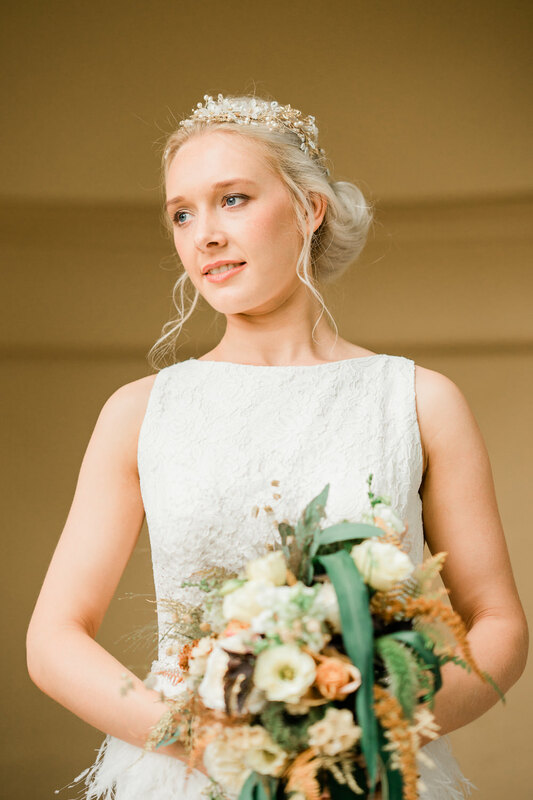 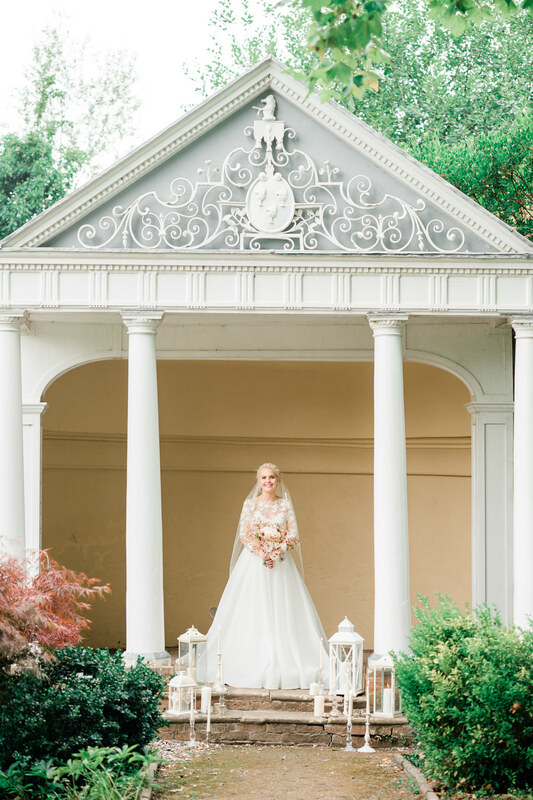 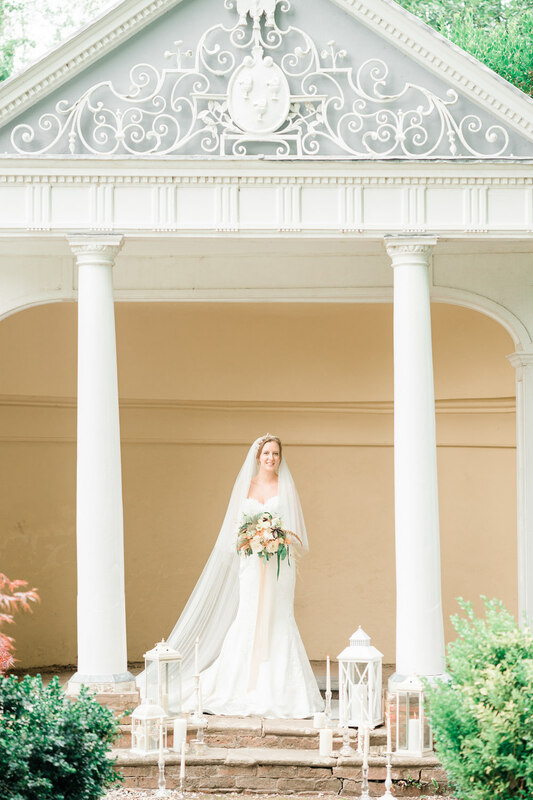 Whilst creating the theme for this shoot, I was inspired by the intricate details in the architecture of the house and the delightful gardens with the beautiful iron and stonework, majestic trees and cottage garden planting. 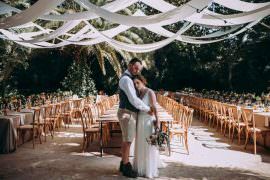 The garden has a very romantic feel and on shoot day Jo, our photographer, took advantage of the golden quality of the late summer light. 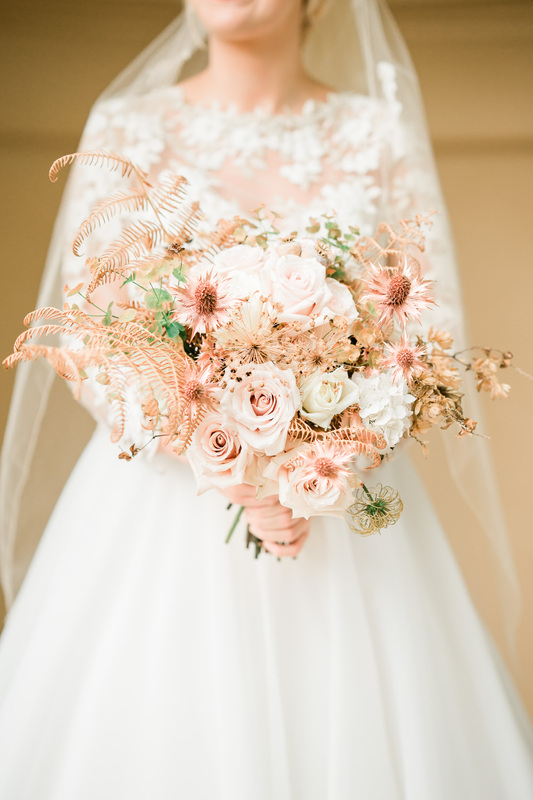 I’m hugely inspired by pastels and gold tones so from the beginning I knew this shoot was going to be beautiful for me to capture! 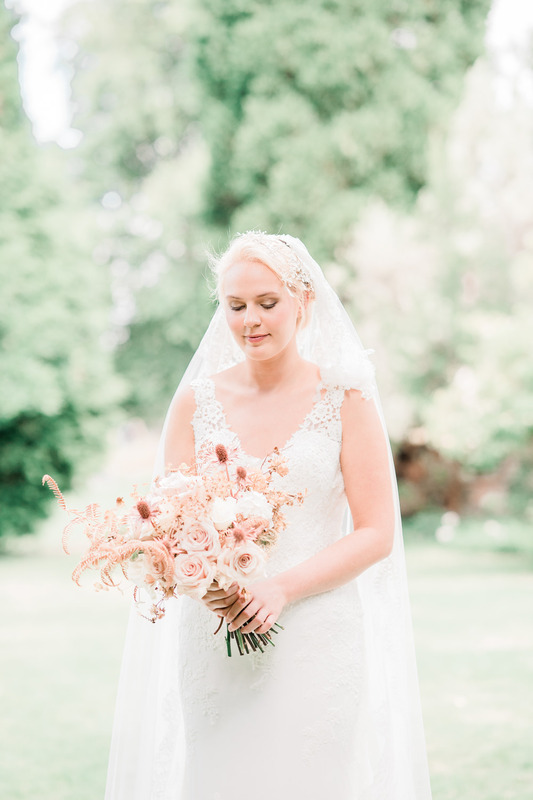 One of my favourite things as a wedding photographer is seeing how the work of different vendors comes together to fit a brief and how it then translates through my lens. 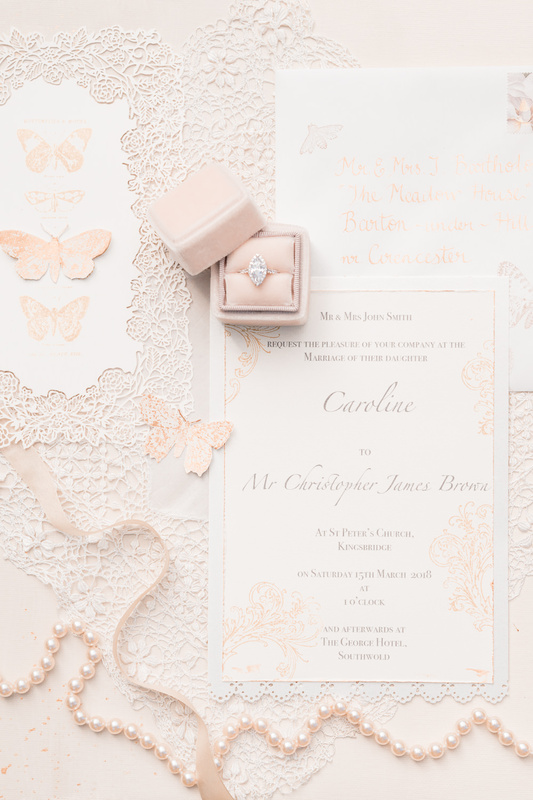 I just loved what every member of the team brought to the shoot and how perfectly each element fitted into the theme. 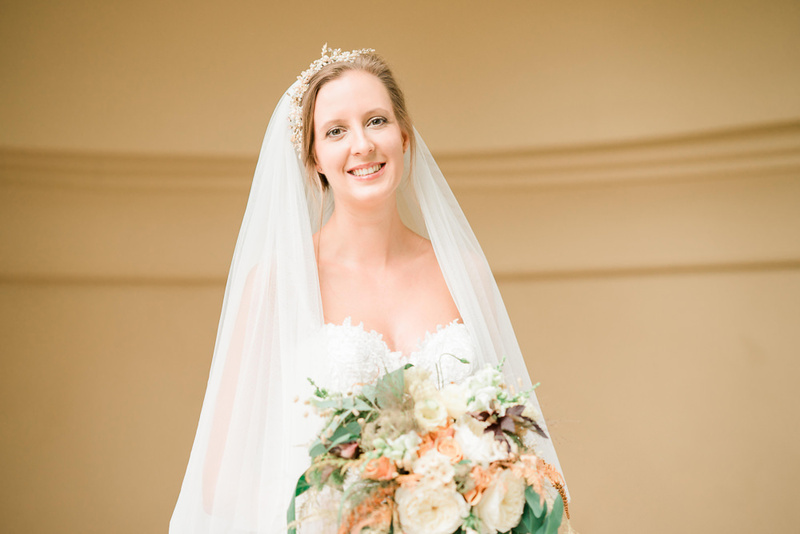 Bright and airy imagery is my passion, I think this worked really well with the elegance of what we were shooting. 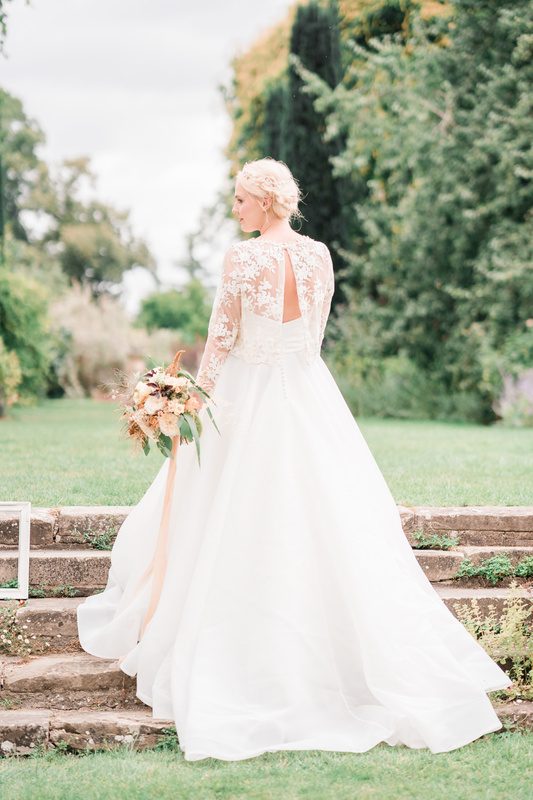 It was a real pleasure to work with such a talented team! 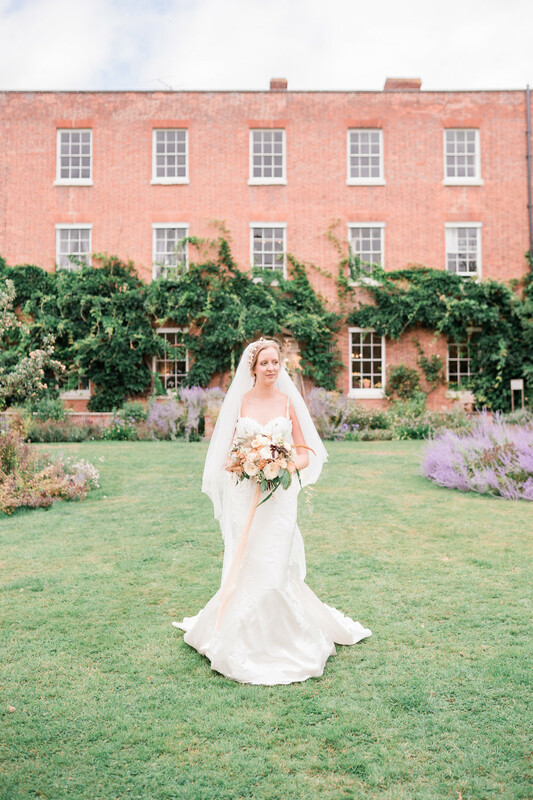 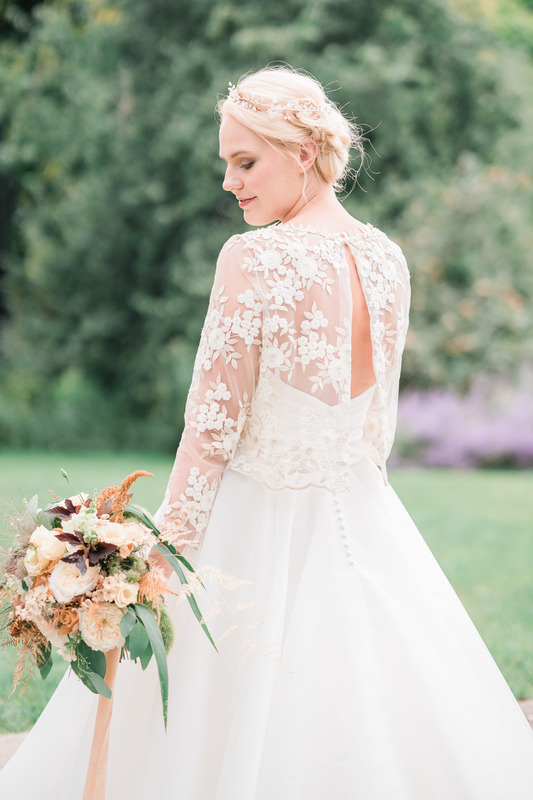 Debbie at Burford House Bridal provided the gowns from Pronovias. 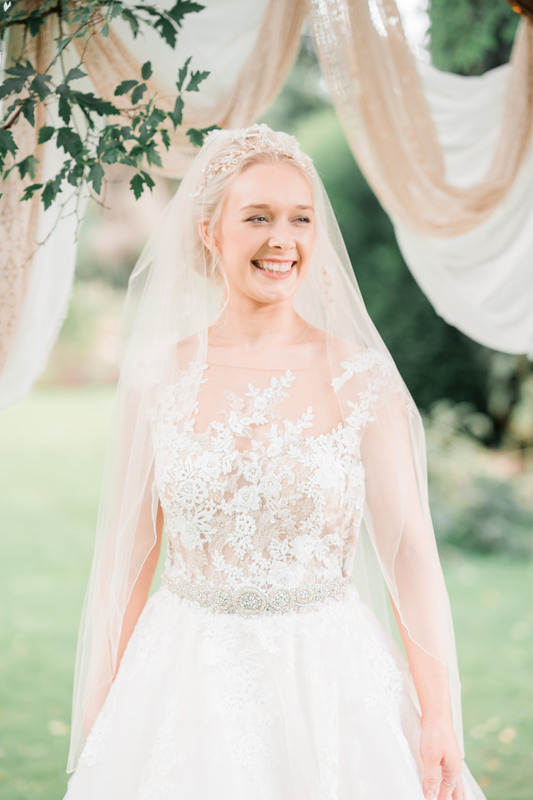 They are traditional gowns with a modern flair and were chosen for their vintage style lace, intricate embroidery and bead work and pale gold elements. 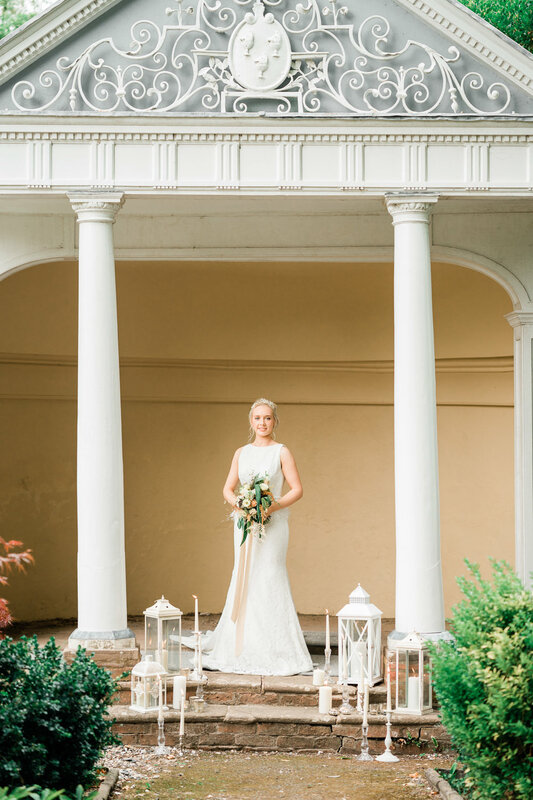 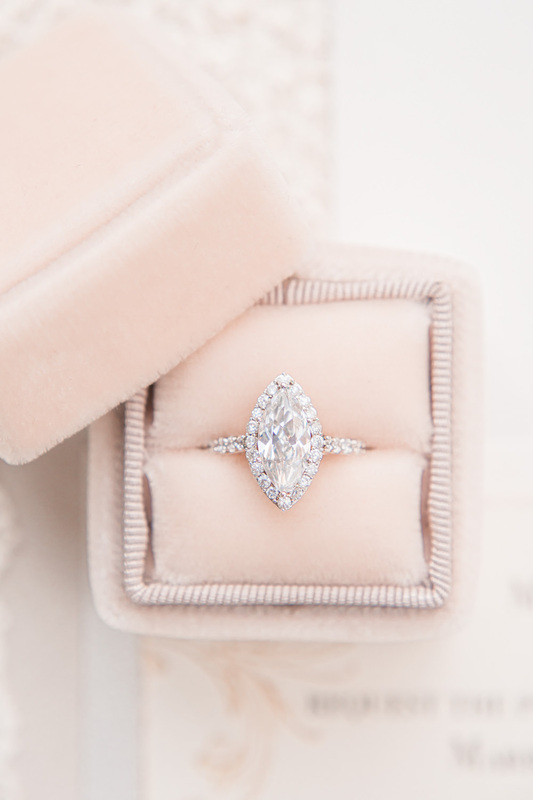 Classic and elegant – they fitted the romantic setting perfectly. 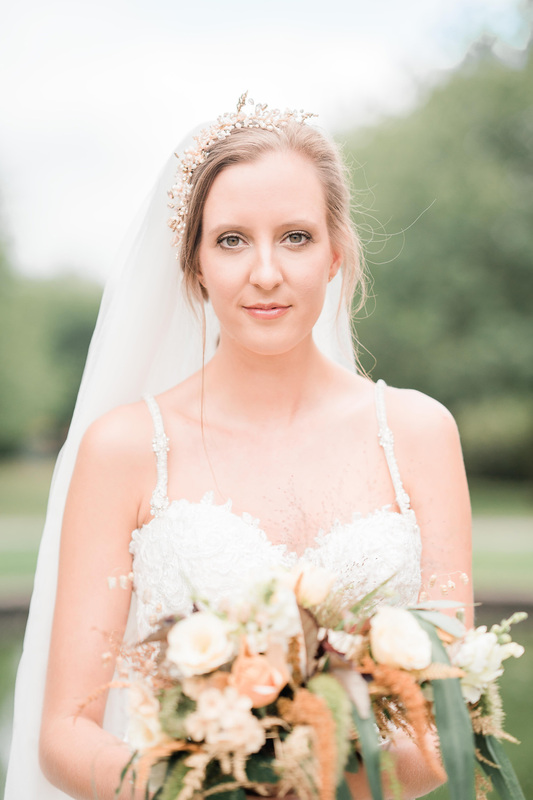 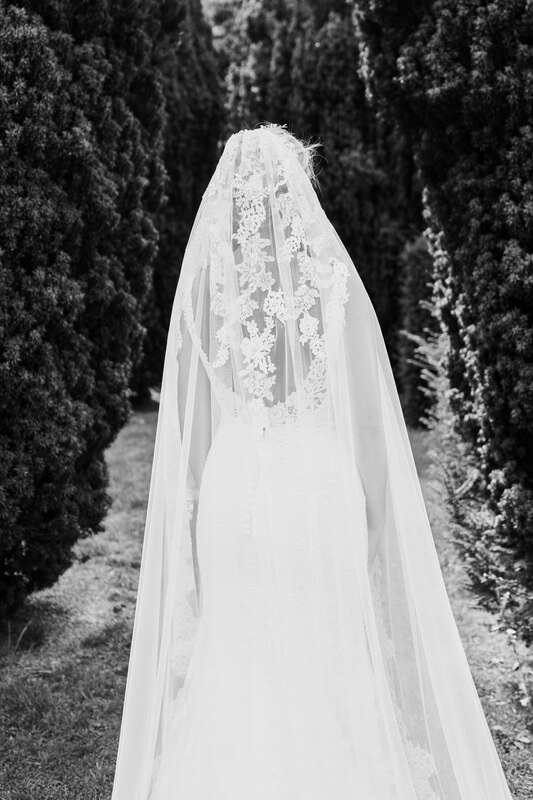 The gowns were complimented by bespoke hair accessories, veils and separates by Tulle & Blue. 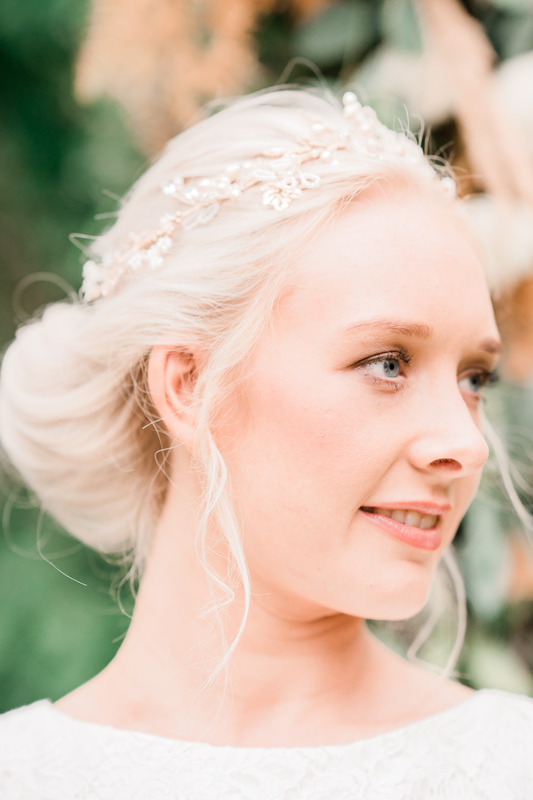 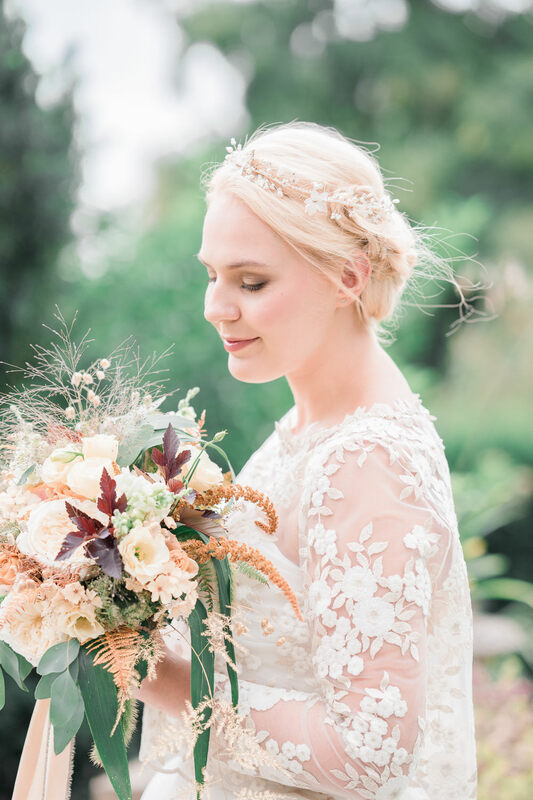 Each piece is designed and hand made to order and I made some special themed hair adornments for this styled shoot using blush German opals, gold leaves, hand painted flowers and lots of pearls and crystals in hues of pale sand, blush and golds. 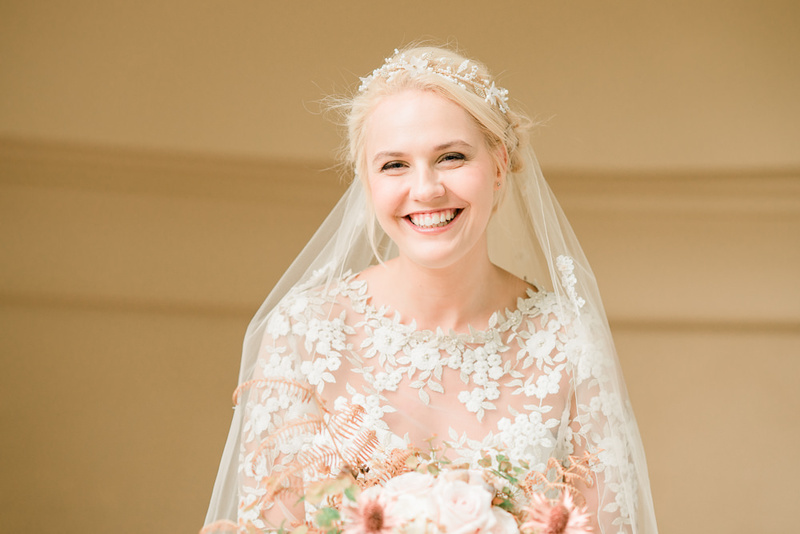 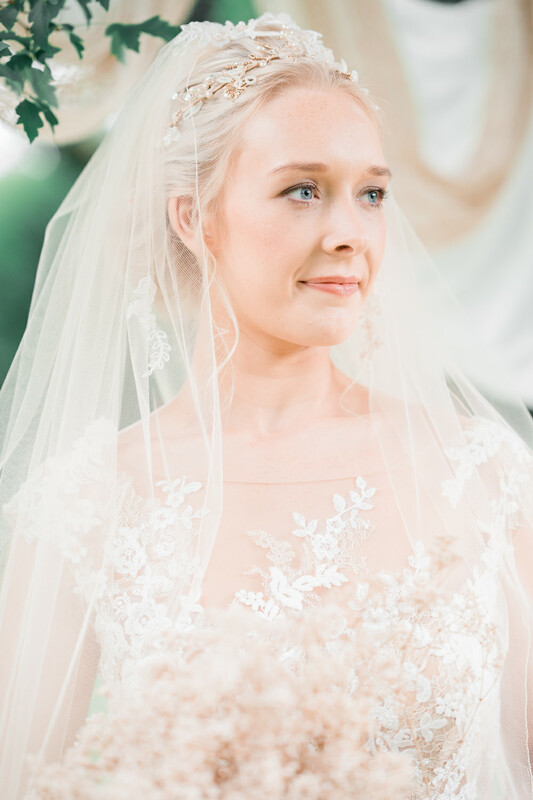 The pale gold veil has hand appliquéd lace motifs which are beaded and compliment the champagne coloured bridal top which is embellished with ivory pearls. 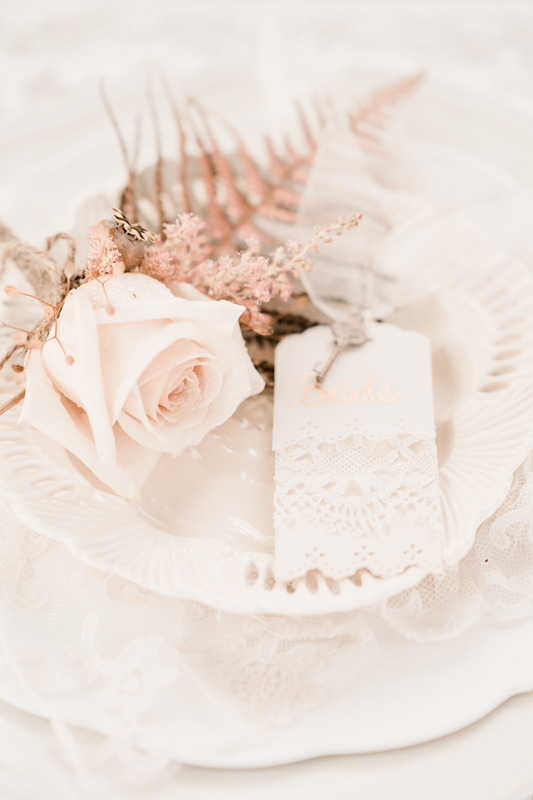 My mantra is – “It’s all in the details!” – it is those details that personalise your wedding and everything you choose adds to the perfection of the day! 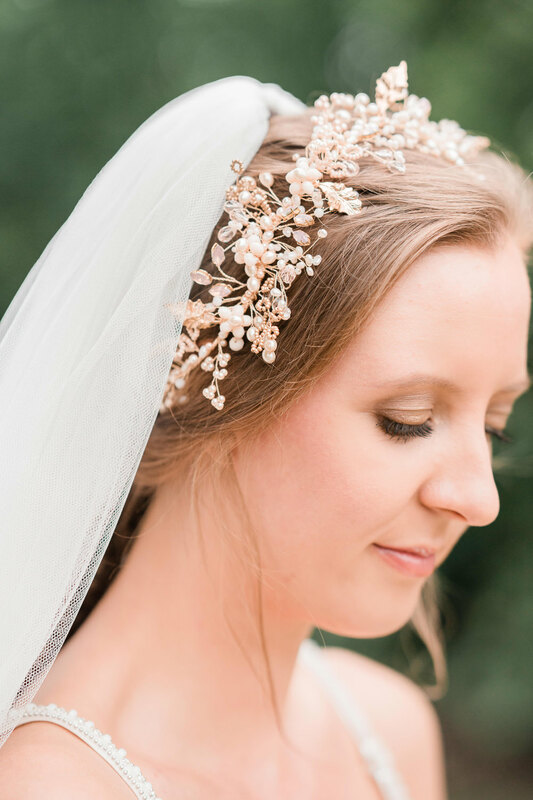 When you get the details right the whole wedding comes together seamlessly. 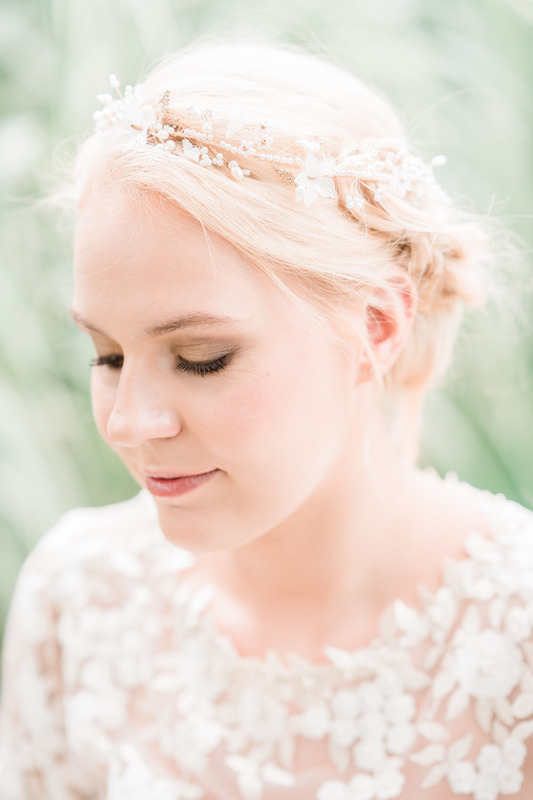 That was the joy of styling and working on this shoot! 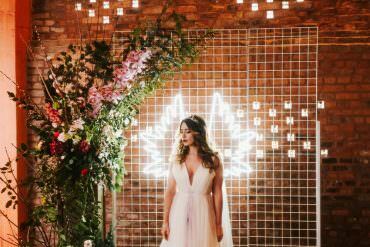 Right from the start all the suppliers were on board and completely embraced the brief and mood board, which is always huge along with details of Pantone colours! 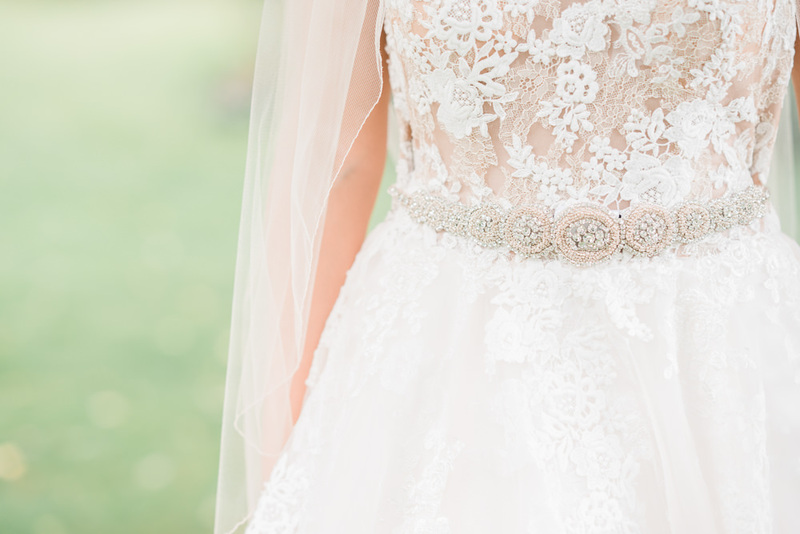 So many gorgeous details and so many talented ladies too! 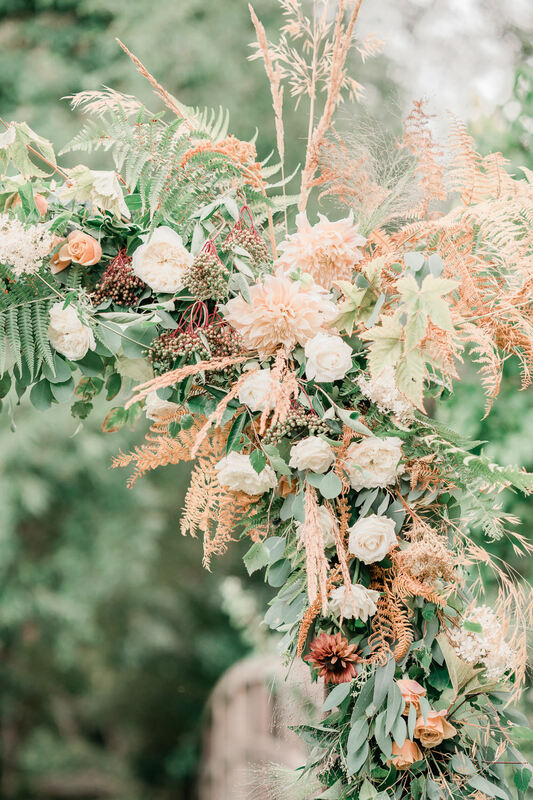 Our lovely floral artists Kate from Damson and Vine and Sue from The Flower Garden worked tirelessly all day creating the stunning florals which included a huge arch adorned with ferns and golden dried grasses, berries and full blown Roses and Dahlias in Apricot, Blush and Copper. 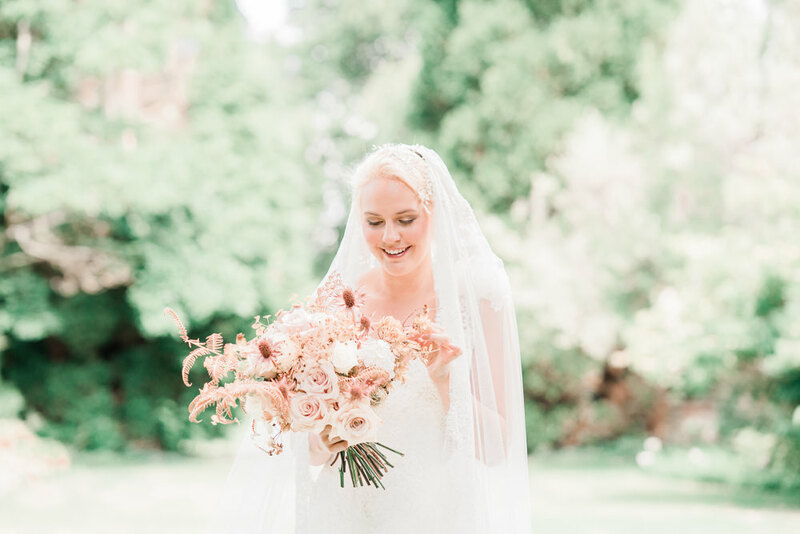 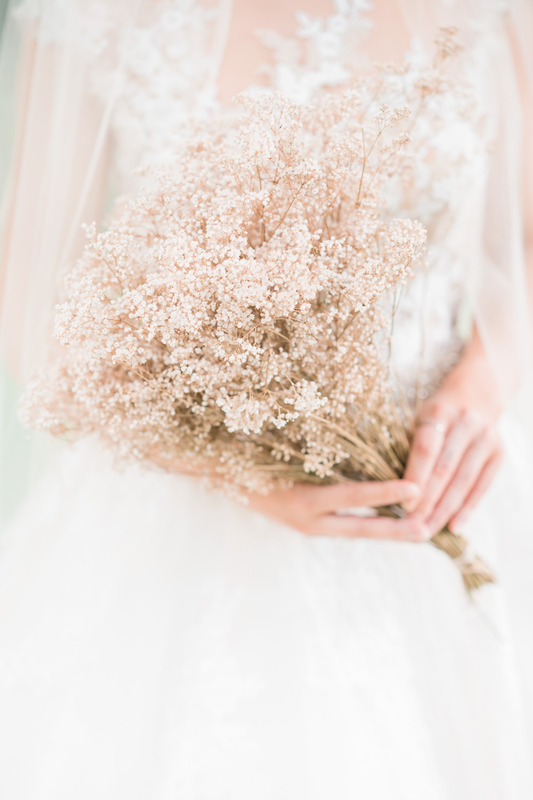 The large bouquet was a mix of Blush Roses, dried Hydrangea and Poppy heads, copper sprayed Eringium and Fern with beautiful textured grasses and seed heads. 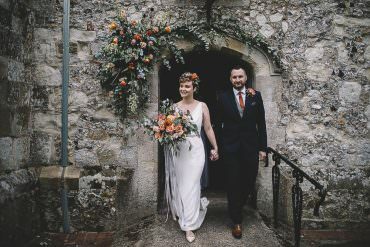 The main elements of the second bouquet were millets, quaking grass/Briza, Fountain grass, bracken, golden asparagus fern, David Austin rose ‘Patience’, ‘golden mustard’ rose, phlox ‘Creme Brûlée, Amaranthus ‘Hot Biscuits’, eucalyptus and physocarpus. 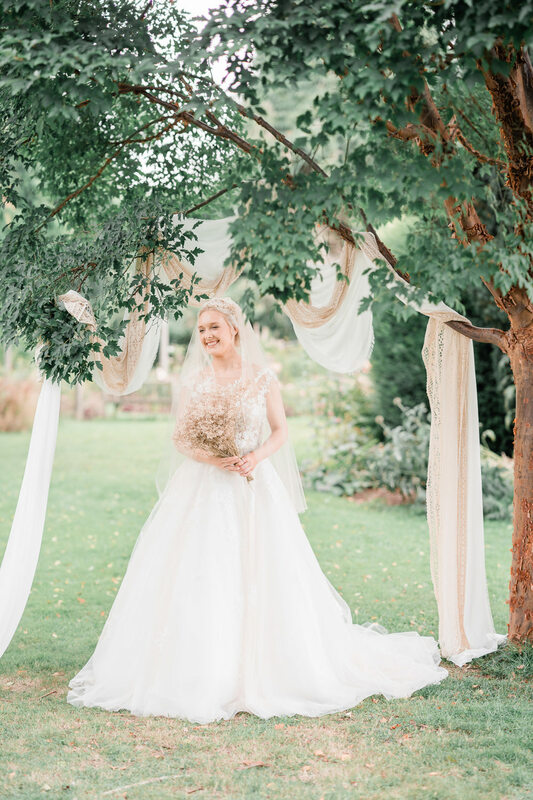 Sue and Kate used a combination of fresh and dried material to create lots of interest and textures and to compliment the natural hues of the garden. 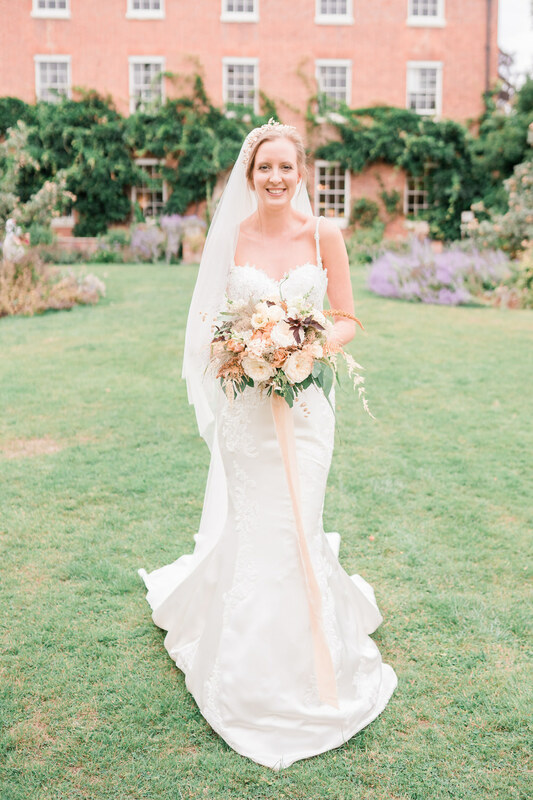 The loose informality of the floral style fitted well with the country garden theme giving that ‘just gathered’ look! 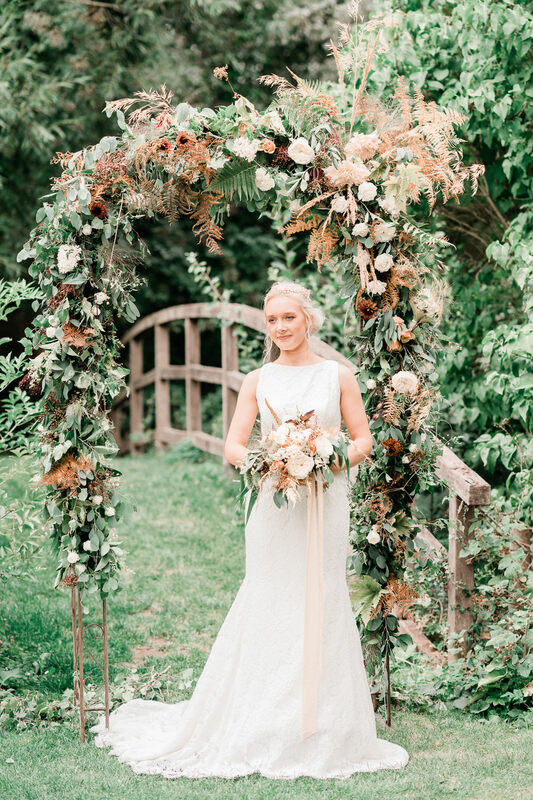 The arch and bouquet were inspired by the hazy, late Summer days when Autumn starts creeping in but beauty still abounds in the garden. 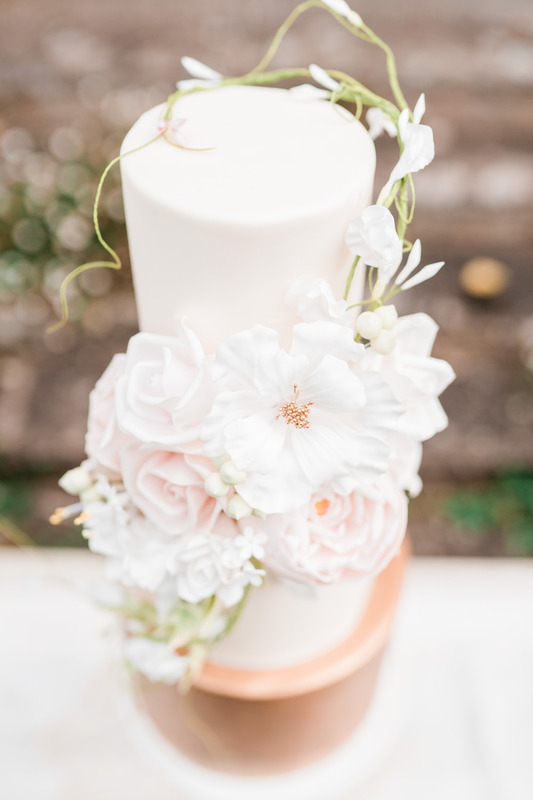 Lush garden roses combined with seed heads and blousy ‘Cafe au Lait’ dahlias showcase the very best of this time of year. 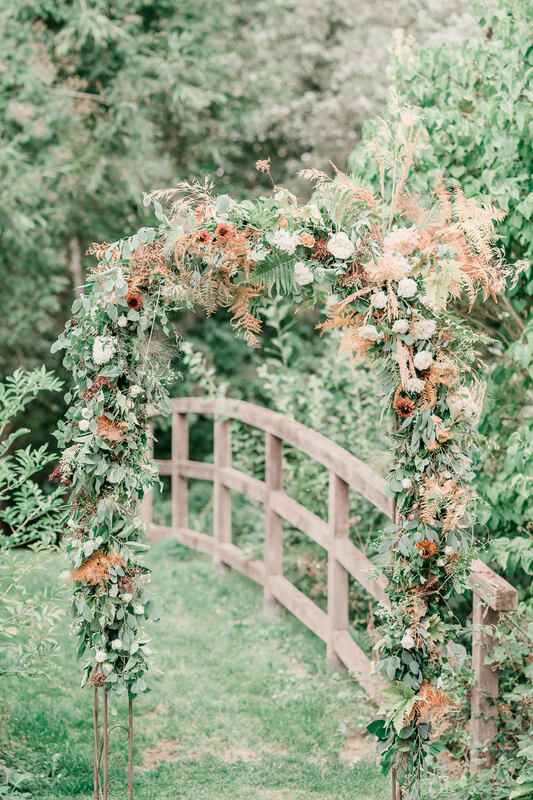 Our florals are always influenced by the seasons around us, this particular time being a personal favourite, as summer ebbs away and we are treated to a glorious show of colour in the hedgerows and tree lines. 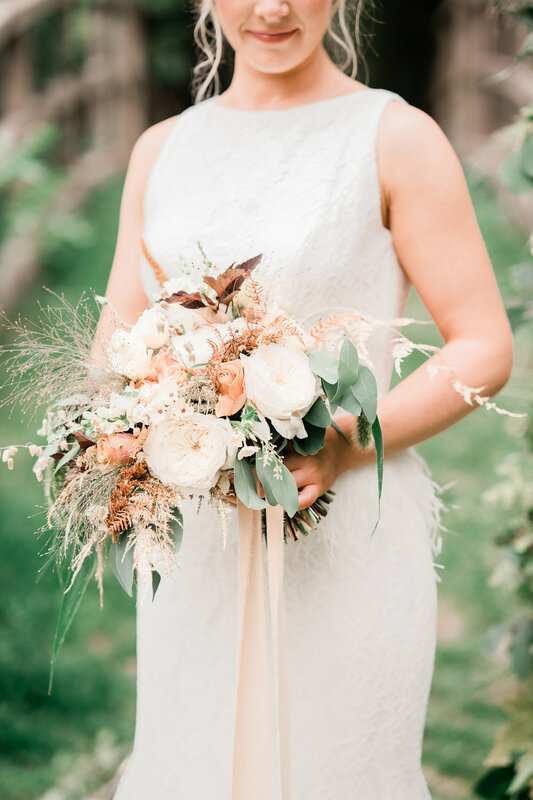 Darker foliage in the bouquet adds the unexpected to the usual neutral tones seen in bridal bouquets, and echoes the plentiful berries and fruits in the garden (without the worry of stained dresses!). 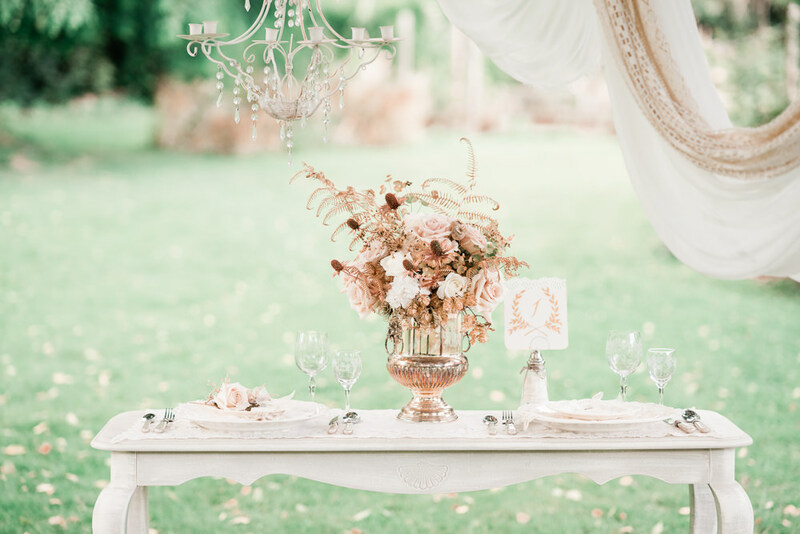 Stunning vintage props were provide by Sarah and Maxine and included a French ‘Sweetheart’ table set for a romantic wedding breakfast for two! 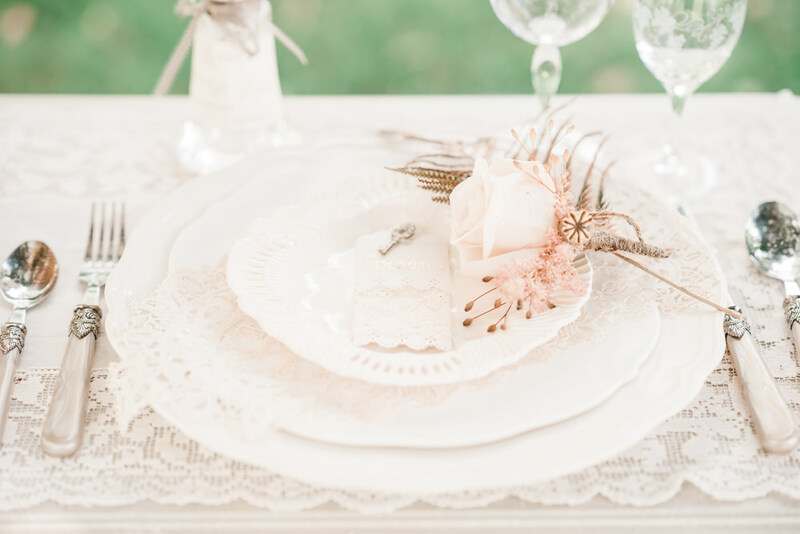 They used vintage lace and textiles to soften the simple but elegant look which was complimented by French cutlery and Creamware plates. 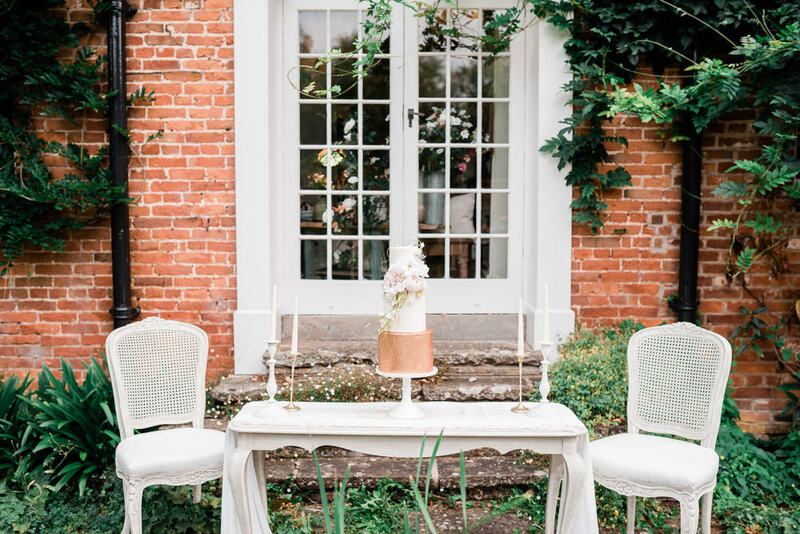 Maxine lovingly painted the beautiful French console table and vintage chairs, the details of which reflected the architectural details of the house and and ironwork in the garden. 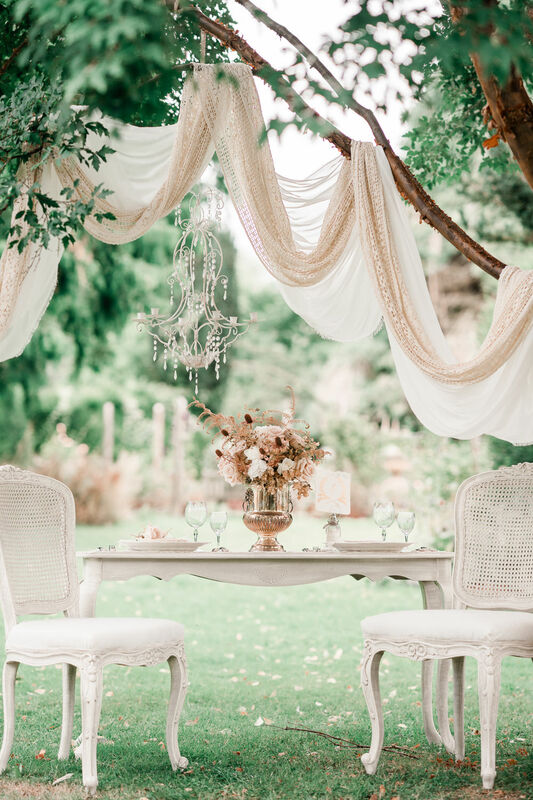 Vintage birdcages adorned the trees and candles and tea lights in lanterns and an eclectic range of candlesticks and vessels made a lovely foreground against the backdrop of the Pavillion. 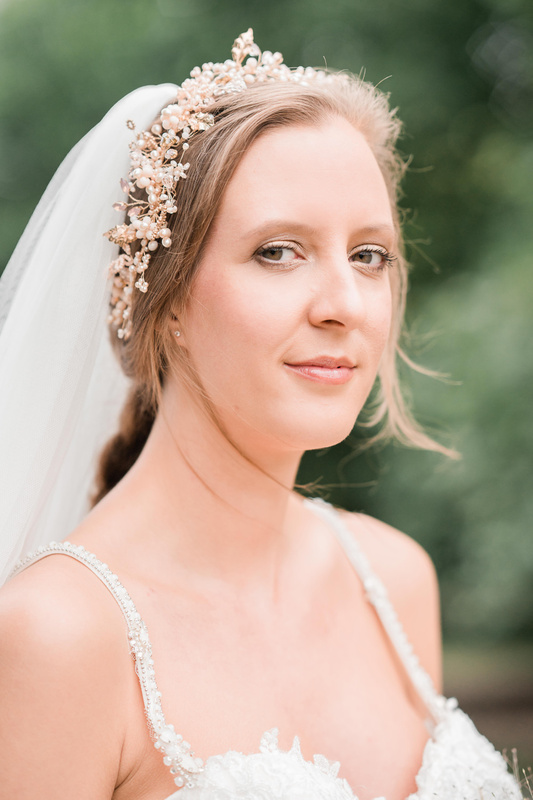 We wanted to show that an eclectic mix of accessories and adornments can make quite a statement at your wedding! 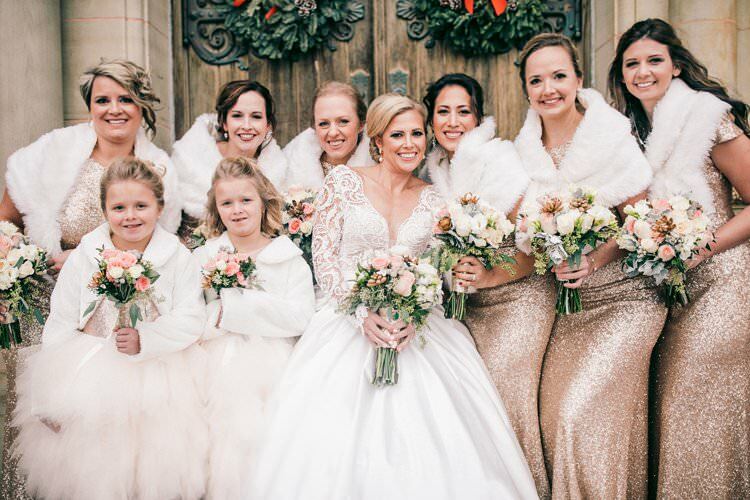 At Pretty Little Gorgeous we believe that you should have the most unique event experience, filled with beautiful things that create moments and memories that will last a lifetime. 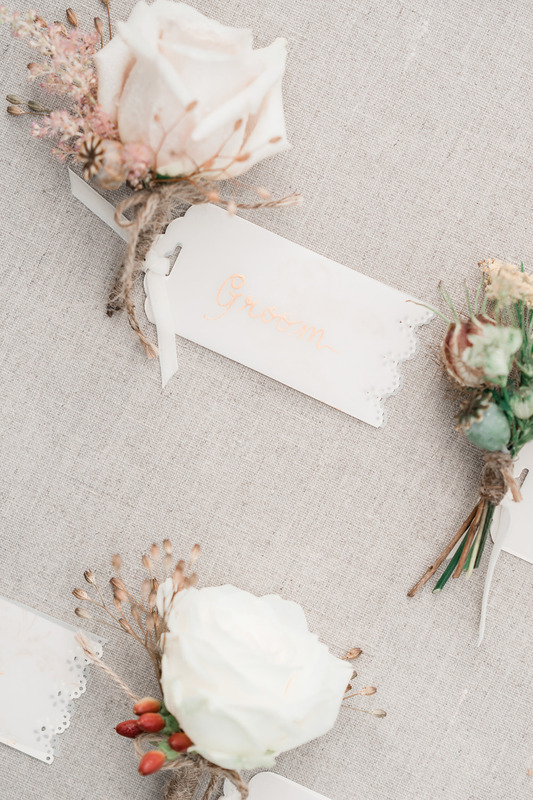 It’s the little things that make this happen and getting it right for each individual wedding really counts reflecting the personalities of the bride and groom. 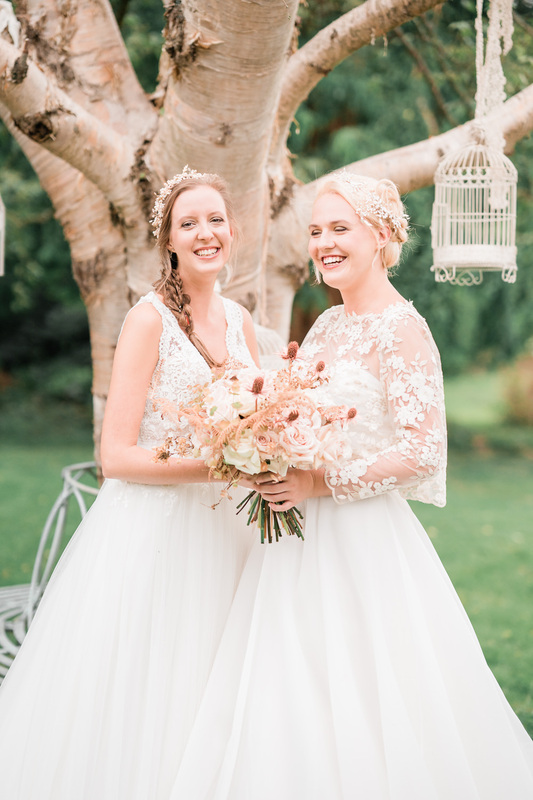 We loved working on this amazing shoot as the women involved are all so passionate and brilliant in their field, it was such an honour to be invited to be part of it. 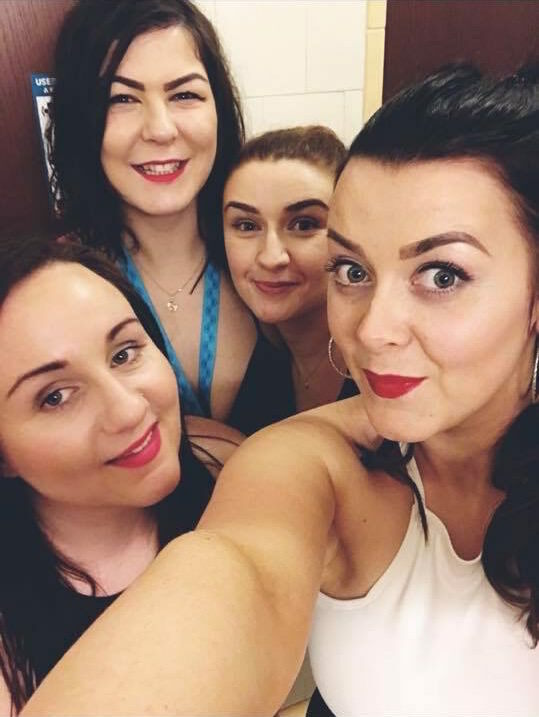 Everyone worked together and made it such an enjoyable day and we at Pretty Little Gorgeous believe the results speak for themselves. 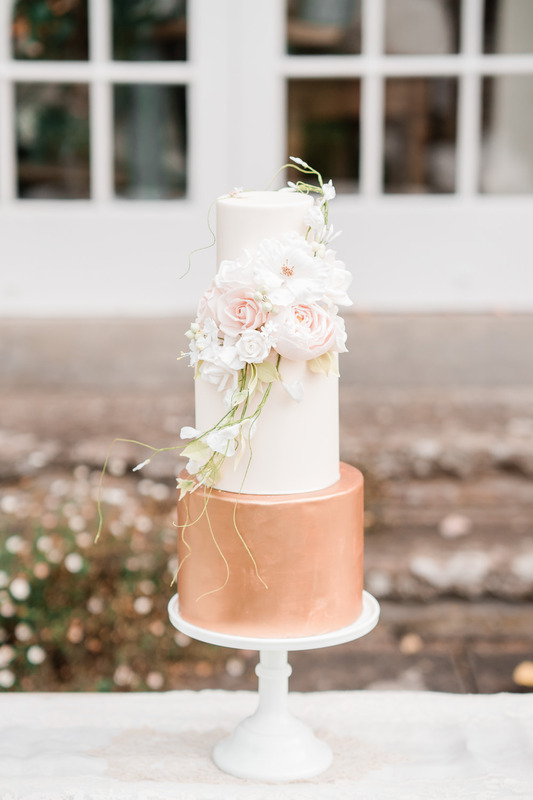 The tiered cake by Liz with it’s copper base picked up on the colour of the brickwork and it’s delicate flowers reflected the stunning florals from the shoot. 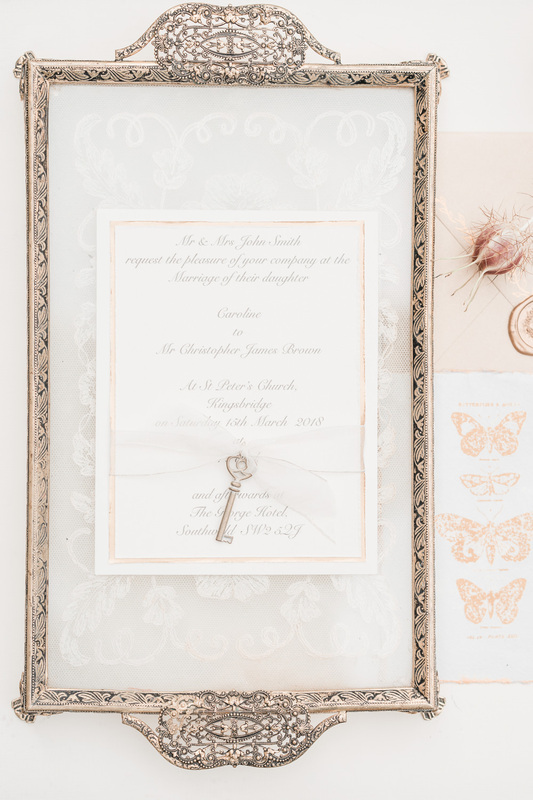 The Wedding Paperie was designed to be elegant with a classic French feel – hand stamping and lettering was worked in gold German inks and finished with a simple organza ribbon and lucky vintage key. 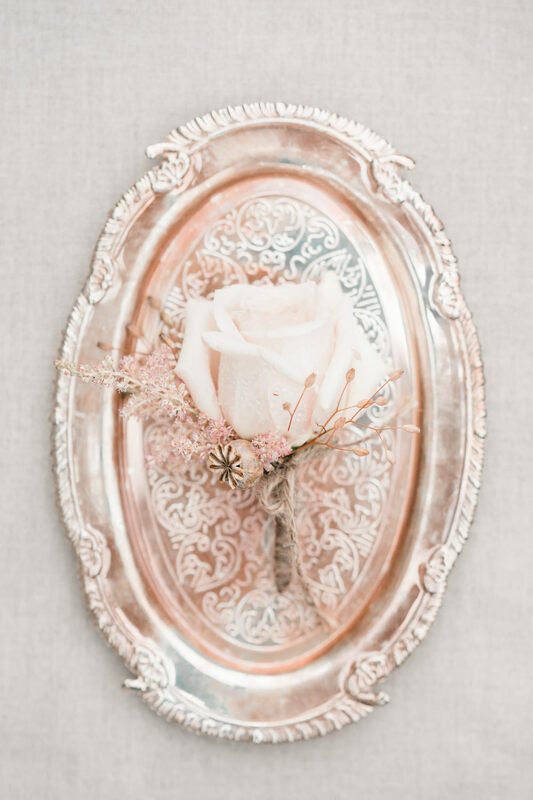 Complimented by a handmade heirloom velvet ring box in pale sand which were all handmade by myself at Tulle & Blue. 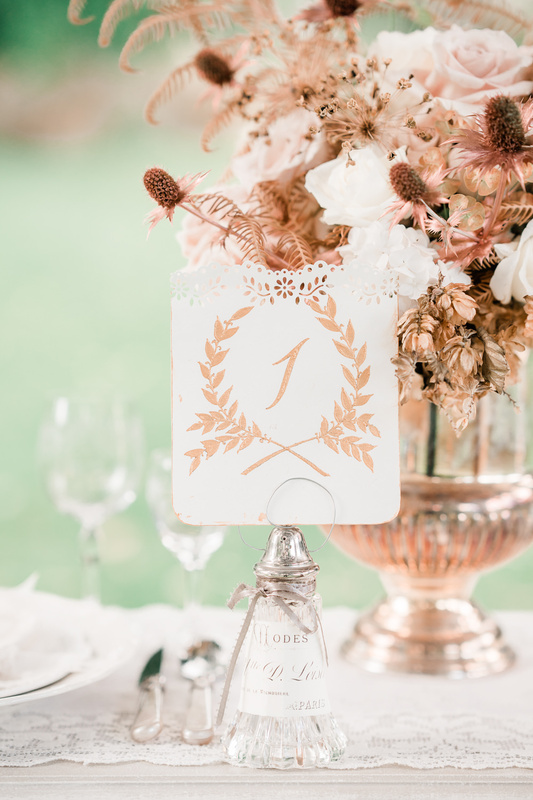 We created images that show a timeless, classic country house wedding with elements of faded French Vintage and ivory wire work with a colour palette of the last golden days of summer – Champagne gold, pale apricot, blush and ivory accented with autumnal tones of gold and bronze which we hope will inspire brides and grooms to be! 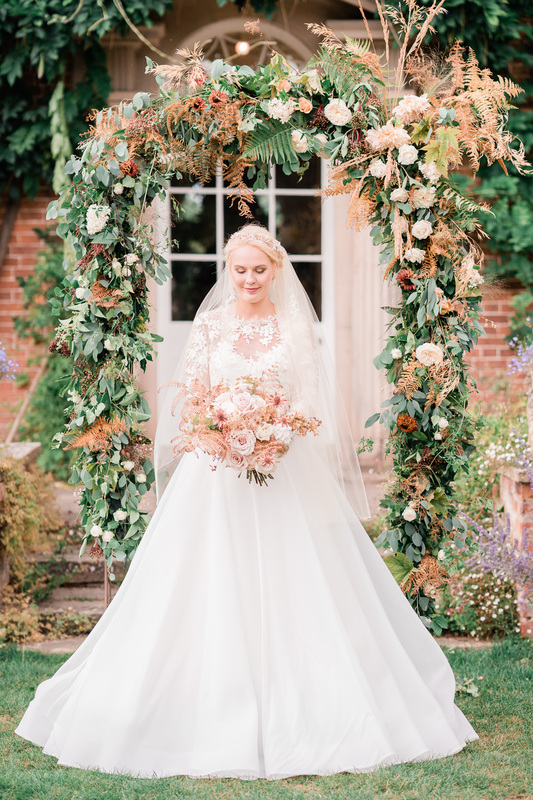 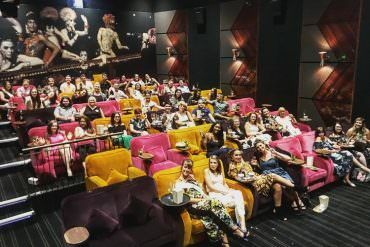 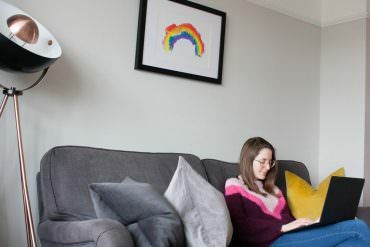 A team of very talented suppliers – all of whom are one woman businesses – worked together to create all the components which came together on the day! 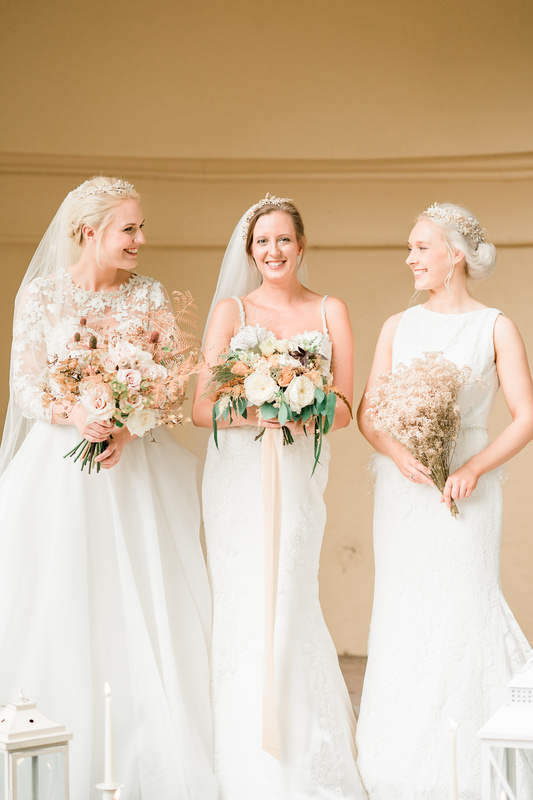 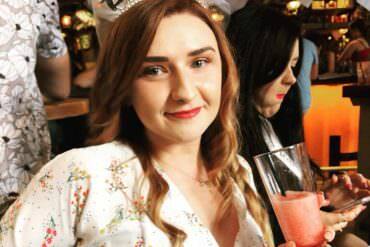 We had a ball and would like to thank our lovely models – Izzy, Paige and Isla!